This month’s notable figure in public health does not stand alone in his crowning achievement- the discovery of HIV as the cause of AIDS. As a result, the other members that contributed to the discovery of the link between HIV and AIDS will also be given a nod. Luc Montagnier was born in France in 1932 where he grew up amidst World War II and the German occupation of the country of France. He was inspired to pursue virology after learning of the discovery of the Tobacco Mosaic Virus and the subsequent research conducted on the virus. His early research in virology involved hand foot and mouth disease, which proved that viral double-stranded RNA can replicate in a similar fashion to DNA. His research then turned to oncogenic viruses, or viruses that cause cancers. He discovered that the genetic material contained within the virus is enough to have a cancerous effect. His research specifically focused on oncogenic viruses that contained RNA instead of DNA. These viruses became known as retroviruses. 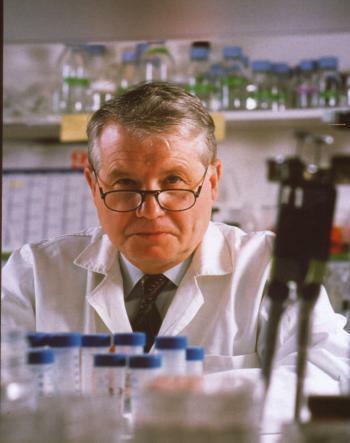 Dr. Montagnier’s lab began searching for retroviruses in human cancer patients. Today, thanks to the research of Dr. Montagnier and other scientists, we now know that HIV stands for human immunodeficiency virus. The virus’s transmission to humans is linked to a type of chimpanzee in Central Africa. This transmission from animals established a new disease among the human population and eventually began a worldwide outbreak of HIV. The HIV virus attacks a component of the immune system, called T cells. Since it affects the immune system’s function, people with HIV are more likely to get infections and as the disease progresses, uncommon opportunistic infections and cancers can result from the body’s inability to adequately protect itself. AIDS is the most severe stage of HIV. At this level, the number of T cells is below 200 cells per cubic millimeter of blood (normal is 500 to 1,600). Unfortunately, there is no cure for HIV or for AIDS, but there is treatment available to prolong life and slow the progression of HIV. Without treatment, people with AIDS typically survive about 3 years, but people who are treated with antiretroviral therapy (ART) while in the HIV stages of the disease can live almost as long as their healthy counterparts.